(VIDEO) Anonymous Sends Warning to Police & KKK in Ferguson: "We are the law now"
Ferguson, MO — A new video was released from the hacker group ‘Anonymous’ Thursday which directly threatens the Klu Klux Klan over their threats to kill protesters. It was recently reported that the hacker group had taken over the Twitter account of the KKK after these threats of violence against the protesters. The two groups have apparently been exchanging words and cyber attacks for a few days now. This latest video seems to respond to the most recent threat by the KKK. Anonymous claims that they will protect the “peaceful protesters,” from not only threats from the KKK but from the police officers who may pose a threat to protesters as well. Below is the Anonymous video which was submitted to News2Share Thursday morning. 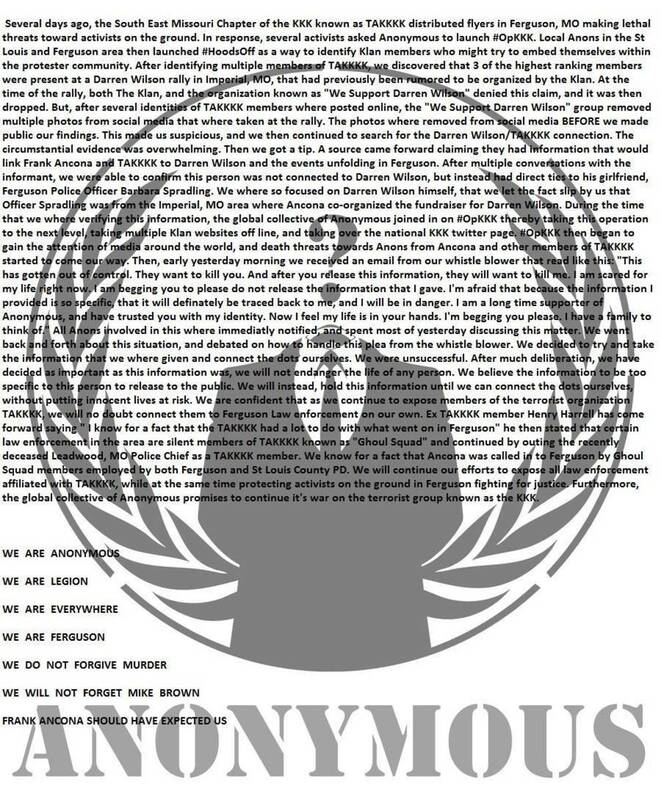 Thursday afternoon Anonymous issued the following statement, claiming that they have information that may actually link Darren Wilson to a Missouri Chapter of the KKK. It should be noted that the Free Thought Project stands against such acts as the initiation of violence or destruction of private property, regardless of whether or not it is a police officer or a private citizen.